LONDON - Oct. 11, 2017 - PRLog -- Telecom, media and technology advisory firm Xona Partners has teamed up with global news and events provider TMT Finance to present a senior executives workshop highlighting the latest investment strategies and merger and acquisition opportunities driven by Artificial Intelligence in the TMT sector. 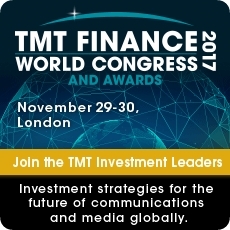 The one-day workshop, which is part of the TMT Finance World Congress 2017 taking place in London from November 28-30, will provide insight into the latest investment and corporate development strategies for the rapidly changing AI technological landscape, and feature senior executives from global telecom, media and technology companies, private equity firms and institutional investors, and senior financial and legal advisers and consultants. Professor James Shanahan of Xona Partners, who will lead the workshop, said: "Artificial Intelligence (AI) is a burgeoning industry worldwide, with revenues of US$6.5 billion in 2016, growing to US$300 billion by 2025. Companies, such as Google, Facebook, Apple, Amazon, and Hooli Con (GAFAH), Baidu, Yandex, Nvidia, and venture capitalists alike are investing heavily in AI research and applications. This has led to a corporate arms race for AI startups with over 250 acquisitions in the last 5 years." The workshop programme (http://www.tmtfinance.com/world/programme/) will be based on Xona Partners' three decades of heavy involvement in all aspects of AI, from research to product to investments, across 5 continents and multiple industry sectors. The programme will cover areas such as: AI Investor or entrepreneur – a how-to guide to valuation, investment and M&A in this new era; Top 10 AI market trends to watch in 2018 and beyond; and AI 101: a look under the covers at what is enabling AI from hardware to software. Shanahan added: "We will share with senior executives the rapidly changing AI landscape from a corporate and investment perspective providing analysis of key issues such as AI valuation models, investment perspectives, M&A opportunities, market trends and predictions, while also delving into some of the theory that is enabling AI from hardware to software." Over 350 senior executives will gather in London for the annual TMT Finance World Congress which also features the TMT M&A Awards (http://www.tmtfinance.com/awards/) and the Media Leaders Summit (http://www.tmtfinance.com/media). The event focuses on leadership investment strategies, mergers and acquisitions and new partnership opportunities.